As far as I know there is little to no interest in an 8AM Sunday Long Run tomorrow. As suspected, after a winter of getting up to run in cold weather, we all deserve a little rest. Due to many conflicts it seems the Providence training group is running on their own for the most part at various times through the weekend. My advice: If you ran Boston last week, sleep in! If you’re running Providence drop a note here if you’re looking for someone to run with, or just get your 12 miles in yourself. If you’re in neither of those groups go run a race, take advantage of all this training all winter. Walt and I are both available this week. We can probably cover the whole run by rolling past each other. Jim, when you have some time, post the route and number of stops. I’ll come by you place on Saturday to pick up supplies. For all the Boston runners that were running down their dreams today, CONGRATULATIONS! Through some warm temperatures, a strong sun, a bit of a head wind, and the challenges inherent in the course, you all made it to Boston! Each week I’ve summed up the training milesÂ we’ve covered toÂ get you to the starting line, now it’s your turn to sum up your path from start to finish.Â First timers, what were your impressions of the run compared to other marathons? Veteran runners, what made this runÂ different than all the others? Highlights? Lowlights?Â Share them with us, don’t let the big day go by quietly. This week a small crew of runners left Brueggers for a taper run for some and for others the longest run evah! As the Boston runners slept in, banking hours in case they find it hard to sleep tonight, only 6 people joined in on the run : Mike MacNeil tapering for the Big Sur Marathon next week, Lois, Nancy and myself tapering for Providence in two weeks, and Sue and Joanne with their sights set on running more than 13.1 miles for the first time. Our water stop crew made us feel spoiled, for 6 runners we had three volunteers, Walt for water stop 1 and Nick and his son Fio for water stops 2, 3, and 4. As Mike headed out with Walt to the first water stop in order to have a taper run closer to 10 miles, the rest of us headed up Main St to Franklin. The pack stayed tight and the weather was gorgeous, high 40s, sunny, and a bit of a breeze. I opted for shorts for the first time on a long run this year, all the women opted for pants. Two layers was the choice up top, either two shirts or a shirt and a light jacket. As we headed up Franklin I got my unfortunate annual taper injury, from too much softball and baseball activity yesterday my right calf decided to send me a message, seizing up as we climbed up Franklin into Stoneham. A little roadside stretching loosened it back up enabling me to continue on but at a slightly slower pace. From Franklin we turned through side streets across Main St in Stoneham over to Forest St in Winchester. Heading into water stop #1 we had already seen three cities and two Main Streets. Water stop #1 was a cheery stop with lots of encouragement from Walt. Here we all decided we were collectively overdressed and started shedding clothes. Outer layers were taken off leaving us with short sleeves or rolled up long sleeves. Lois and Sue converted their pants to shorts by rolling them up over their thights. With the pack reassembled as one, and adding Mike, we headed down Franklin to Washington St. With some debate we stuck to the route instead of taking what would be a less busy and possibly shorter path over to Cross Street. Once on Cross St we followed it into Woburn, another city and another Main St, and over to Horn Pond. This is a new destination for the Sunday Long Run and it seemed to be a popular one. Heading into the parking lot by the pond we were greeted with a smile from Nick and a sneak attack by a nerf gun weilding Fio at water stop #2. This water stop was a fun little stop, not just the usual candy and Gatorade requests, but Nick provided athletic tape for Jo’s sore foot and a pair of shorts for a hot Sue. Fortunately for Sue there was a public restroom available for her to change into them, otherwise this would have been an even moreÂ interesting stop. By the way, if there is ever a wardrobe issue on a run, assume it’s Sue. From here we headed out around Horn Pond which comes complete with interesting characters: the guy that waved us by along the path despite there being absolutely no reason to have to wave us on, the very muscular shirtless running guy, the wood carved statue of a native american person holding a big fish, the person that swore at me while I ran up a hill… oh wait, that was Sue, the same guy waving us on again somehow getting to the opposite side of the pond at the same time we did even though we were running and he was kinda just standing around, and some dogs that theÂ girlsÂ giggled at. Along the way Sue made up a story toÂ go with theÂ Native American Indian statue but the pond comes with its own Native American ghost story and is reportedly haunted. Â We all made it around the pond without any scary moments, except for Sue swearing at me for making her run up a hill. After that we headed back down Lake St, across Main, and over Cross St back to Winchester… where Fio and Nick were awaiting us with another sneak attack, this time we discovered velcro nerf bullets stick to coolmax. After the quick stop we headed back over to Forest St and up a series of hills. I encouraged Sue not to stop and walk up the hill, then we passed some sidewalk chalked footprints drawn next to where some kids had scribbled “Stop Here”. Luckily nobody else noticed them and we all charged up to the next water stop where Nick and Fio had relieved Walt and were joined by Liz who would be coming along for the final 4 miles of the run. As we headed over to Spot Pond next the pack spread out single file along the road. Sue picked the song lyrics for the final leg “a little less conversation, a little more action”.Â We made our way past Grimsby’s one at a time down West Wyoming back to our original Main St. As we filed back in to Brueggers it was unanimous, today was a succesful run on a new route in great weather with fun conversation! Thanks Walt, Nick and Fio for the water stop refreshment and entertainment. Congratulations to Sue and Joanne on a good 14.1 mile run (it wasn’t that hard, was it?). Liz, thanks for joining us for part of the run. And for the rest of us, check off one more taper run towards our goal. 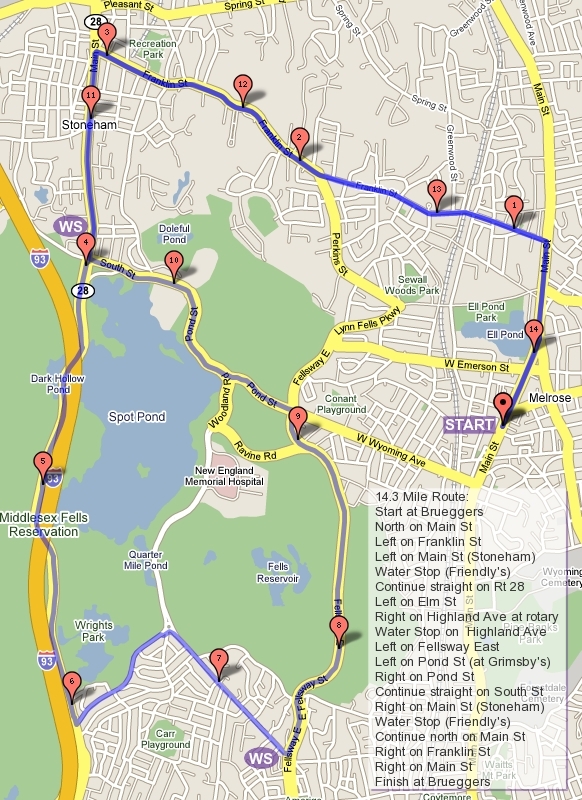 The Boston Marathoners have their weekend run all planned out, but what about the rest of us? Those running Providence are in for something between 14 and 15, how about the rest of you? Before I make up a map I thought I would get a little feedback from the rest of you on distance and directional preference. I’m thinking we could do a loop around Pine Banks and then out to Lake Quannapowitt… or maybe a run out to Winchester, we haven’t been there in a while. Let me know what people are interested in and I’ll post a map later tomorrow.